Our tax counsel team and I were reviewing the new legislation, the Inspector-General of Taxation’s report of his Review into improving the self-assessment system, and emerging press releases related to superannuation. The response: a series of timely press releases and media engagements leading to a number of quotes in the national press. This is what happens when our volunteer members and our professional staff work effectively to deliver great outcomes. As president, I was extremely proud and grateful for the work done by all. This is why The Tax Institute is the leading professional body in taxation. As I visit various states, I continue to be impressed by the depth of our membership. Of great interest to me is the number of hours we invest annually in consulting with government or government bodies. Download a copy of four free case studies [PDF] taken from the Division 7a Handbook 2012-13 that illustrate several aspects of the operation of the Div 7A rules and possible implications. loan and payment by companypayment to trustunpaid present entitlement, anduse of company assets. distributable surplusunpaid present entitlement and the operation of TR 2010/3 and PS LA 2010/4, andunpaid present entitlement created after end of income year. 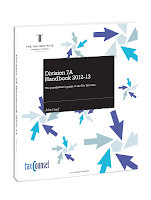 Download the case studies [PDF], and purchase your copy of the Division 7A Handbook 2012-13 from our website today. John Gaal of TaxCounsel is the author of our Division 7A Handbook 2012-13. At The Tax Institute’s recent National Convention, much of the discussion and technical output was focussed on the multitude of tax issues in the SME sector. As politicians love to say, small business is the backbone of the Australian economy, responsible for approximately half of all private sector employment of the Australian workforce. However, as demonstrated by the raft of tax issues raised and discussed at National Convention, the SME sector continues to be strangled by excessively complicated tax laws which are themselves littered with cumbersome "integrity provisions". We remain concerned with this complexity and continue to advocate for the need to consider the unique investment, business and funding considerations that arise in the SME sector when writing tax laws. To this end, we recently made a submission to the Productivity Commission with respect to their inquiry into "Regulator engagement with small business". This month’s complimentary technical paper for members provides an update on tax risk and corporate governance. Have you used the Find a Tax Specialist service? Make the most of your membership with The Tax Institute by promoting your services and specialities through our online Find a Tax Specialist listing so that potential clients can find you. To set up your listing, simply select the “Show as Tax Specialist” option in your profile to add yourself to the listing or visit our website to find out more. On 28 March 2013, the Institute will be hosting two asset protection webinars, including “Protecting assets before marriage” and “The Divorce — tips and traps to ensure a tax-effective separation”. Register now and top up your CPD hours without leaving the comfort of your office. What is iCPD? It's tax training and development that you can access from your desk. We understand that your time is valuable. That's why we've developed a range of web-based CPD options designed to suit the needs of the busy tax professional and complement our regular face to face sessions. To understand how you can save time, and boost your CPD hours, with online tax training from The Tax Institute, watch the below animation. As national president, I attend a number of conventions and professional development forums during the year. First off the block was the Financial Services Taxation Conference in Queensland. I have to take my hat off to the presenters, the convention organising committee and, of course, our conference staff. It was an impressive conference, and full credit must go to the presenters. How many times have you volunteered your time to deliver a presentation, written the paper in time for it to be printed, completed your PowerPoint presentation, then arrived at the conference only to find out that the subject you are talking on has just had a major update? Well, the Financial Services Taxation Conference was one of those times. The Tax Institute invites you to attend our brand new convention, "Tax Through the Bottom of a Glass", which has been carefully designed to give you the best possible technical content, while at the same time providing ample opportunity to network with the presenters and your fellow delegates. You have worked hard to attract and retain your most entrepreneurial clients who are pioneering new products or new markets. Now, as their businesses grow, they are taking you with them into unchartered waters where you will encounter various taxation issues and opportunities of which your clients may not yet be aware. In fact, many taxation issues that might have been perceived as only for the "big end of town" can be highly relevant to small and medium, and even micro enterprises in any industry. Working with your clients to discover and deal with their "unknown unknowns" will both challenge and reward you. Members will recall that last month the Federal Government introduced a Bill to implement changes to Part IVA and the second phase of the Transfer Pricing reforms. The Bill is titled: Tax Laws Amendment (Countering Tax Avoidance and Multinational Profit Shifting) Bill 2013. Whilst it is yet to be debated in Parliament, it has been referred for further examination to the House of Representatives Standing Committee on Economics; The Tax Institute has made a submission to the Committee. With respect to Part IVA, we support the maintenance of a robust general income tax anti-avoidance rule to ensure that tax is levied fairly, consistently and according to the policy intention of the tax laws. In line with the changes to tax agent education requirements from 1 March 2013, The Tax Institute has this month launched a commercial law course for those tax professionals who require this field of study to register as tax agents. The Course in Commercial Law has three units available and specific “modules” which relate to Tax Practitioner Board (TPB) required topics. The units are delivered via distance, supported by webinar tutorials and a course convenor. We have received a great response for the first intake for our Chartered Tax Adviser Program courses — CTA1 Foundations, CTA2 Advanced and CTA3 Advisory. You and your staff can enrol now in these practical and relevant courses for study period 2, 2013. In particular, if you are considering becoming a Chartered Tax Adviser (CTA), ensure you enrol in the one and only CTA3 Advisory Exam in 2013 which will be sat on 27 August 2013. Three minutes with Jemma Sanderson, CTA, the author of our SMSF Guide 2012 and Director at Cooper Partners Financial Services, who is presenting at our upcoming superannuation seminars. What hot topics will you be covering? The last six months has seen some great guidance from the ATO, as well as draft legislation with respect to pensions and the pension exemption. We have been waiting impatiently for such guidance since the release of TR 2011/D3 in July 2011, so there will be a bit of time spent on this area, as well as the ATO’s practice when a fund fails to pay a minimum payment in a particular year. Contributions are always a hot topic, so I’ll also be outlining some new areas to watch in that space. What can participants expect to take away from the day? It is with great delight that we extend to you an invitation to participate in the 2013 Private Business Tax Retreat. Building on the success of the Private Business Tax Retreat in recent years, we have once again put together a challenging, unique and interactive programme that gives direction, resolutions and outcomes to critical questions that are asked of private business tax advisors with a specific focus on CGT small business concessions. when your client sells assets from a trust – the key issues to raise with your client and what you need to be able to answer when your client sells the business – the key issues when signing off internally and how to direct your client what you need to know about contemporary issues impacting private business at the moment. The day will conclude with a wrap-up, providing The Tax Institute’s view of critical private business tax issues. In the context of multinational taxation, the Federal Government’s phrase of choice seems to be: "fair share". The Tax Institute welcomes the Government’s recognition of the need to update current international taxation laws in conjunction with our treaty and major trading partners. The integrity of the tax base is essential to making a lowering of the company tax rate possible. An internationally co-ordinated effort to tackle tax avoidance and re-examine the relevance of existing source and residence doctrines is essential to ensure that Australia’s international tax and treaty network adequately addresses the challenges posed by the increasingly digital international economy and levies taxation on the economic substance of the transaction.